Did Verizon Just Out a 256GB Pixel and Pixel XL? 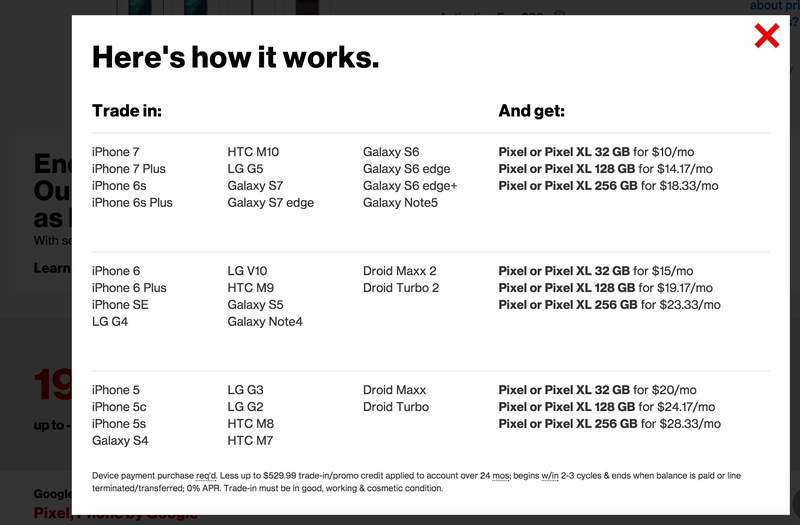 However, if you head over to Verizon’s Pixel or Pixel XL pages and tap on the link to “Learn more” in the $10/mo promo they have been running, you will find mentions of 256GB versions of both phones (seen in image above). They even have pricing set for each depending on what you trade-in to get a Pixel, so there is an opportunity here for someone to get a little hypebeasty. The thing is, it’s likely just an error copied over from the same promo page that iPhones have, since those do come in 256GB configurations. We did check with a customer service representative who is under the impression that the mention of a 256GB Pixel is a mistake. They show zero information of a future 256GB Pixel in the works. Just clearing that up before anyone gets too excited around here.